August see us taking part in Celebration of Craftsmanship and Design 2011, the most established contemporary furniture exhibition in Britain. This will be our 3rd CCD, we seem to participate every 4 years or so, no particular reason why – except perhaps it falls in August when we are often away. 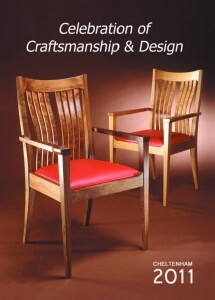 We will be exhibiting a beautiful new pair of ‘Oryx2’ armchairs, so nice they made the cover of this years brochure for the event, and a table called ‘Banquet’ in bleached ash and elm. This is the first year we will have taken part since Jason Heap took the show over from Betty Norbury. It will be interesting to see if it has changed in character much. Jason has brought lots of new ideas in and we are keen to take part, supporting him and the event. These showcase events for bespoke furniture are few and far between, the only other regular show of national importance has been the one that takes place at the Millinery Works in London, which is less established. CCD shows established makers like us, but also through competitions and prizes shows the work of many new talented designers. This year there will be around 60 makers showing 200 pieces of work. The exhibition runs from Saturday 20th to Monday 29th August 2011 and is open to the public from 10am till 4pm daily.